Which nutrients are important for a healthy lawn? All plants, including lawn grasses, need nutrients for adequate growth and development. In fact, at least 18 different nutrients or essential elements are required. When one of these nutrients is deficient it can affect the overall health of the plant. Fertilization of our lawns, landscapes and gardens provides the nutrients that are not adequately supplied by the soil or by natural soil processes. Nitrogen, phosphorus, potassium, calcium, magnesium, and sulfur are considered macronutrients. These are needed in relatively large amounts. However, according to the New York State Department of Environmental Conservation (NYSDEC), there is more than enough phosphorus in our soils. Additional phosphorus is rarely needed for lawns. Calcium and magnesium are supplied to the soil with liming materials and organic matter while rain can supply sulfur. Boron, chlorine, copper, iron, manganese, molybdenum, nickel and zinc are micronutrients. These are just as important as macronutrients, just needed in smaller amounts. When the pH is in the right range, 6.0 – 7.0, these micronutrients are found in adequate supply in the soil. It is rare to have a micronutrient deficiency so don’t be tempted to add a micronutrient application to your soil – just to be on the safe side! The primary nutrients that are commonly found in typical lawn fertilizers include: nitrogen (N), phosphorus (P), and potassium (K). 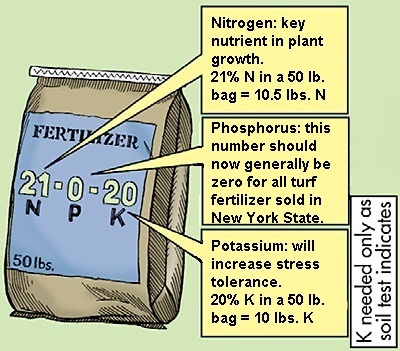 21% is nitrogen, 0% is available phosphorus (P2O5) and 20% is soluble potash (K2O). Which means this 50 lb bag of fertilizer contains actually 10½ lbs of nitrogen, 0 lbs of phosphate and 10 lbs of potash. The rest is material used to spread the fertilizer. The fertilizer ratio in this example is 7:0:6.7. There is no benefit to applying more K than plants need. The fertilizer ratio indicates the proportion of nutrients in the bag of fertilizer. A 20-0-10 has a 4:0:2 ratio. The fertilizer analysis of 21-0-20 has a ratio of about 7:0:7. Potassium (K) helps regulate many plant processes and is known to improve stress tolerance. The need for applications of potassium is best determined by a complete nutrient analysis of your soil. Recent research has shown that large amounts of K are not necessary, especially on established lawns that have clippings returned. So test your soil to be sure if additional K is needed and remember there is no benefit to applying more nutrients than the plant can use. Single nutrient fertilizers can be purchased if only one nutrient is needed. If only potassium is needed potash (0-0-60) could be used.